Louis Le Nain lived in a region to the north of Paris known for its open fields that produced cereals and grain. Although he settled in Paris with his two brothers, who were also painters, he produced a series of rural images that recall the landscape of his youth. 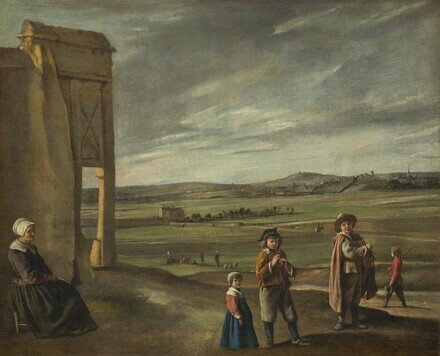 In the Landscape with Peasants, an old woman regards three children: a little girl dressed in white collar and cap, a small boy who plays the pipe, and a boy dressed in a cloak and hat who plays a hurdy-gurdy. In the middle ground several shepherds guard their sheep while the background is dominated by a townscape and rolling hills. The clear spacing of the figures and the interlocked planes of space linking land and sky reveal how precisely Le Nain organized his composition. Their fitted clothes and shoes suggest that the children were not peasants but perhaps members of an emerging class of farmers acquiring land in the early decades of the century. Le Nain's emphasis on the land in this composition implies that the rich soil holds potential profits for these new landowners. The Le Nains' rural subjects were very popular, suggesting their patrons appreciated the agricultural messages encoded in the structure of the paintings. Thomas Gainsborough [1727-1788], London; (his estate sale by private contract, Schomberg House, London, 30 March 1789 and days following, no. 10, as Travelling Musicians). George Hibbert [1757-1837], London; (joint sale with Sir Simon H. Clarke, Christie's, London, 14 May 1802, no. 33, bought in); George Hibbert [1757-1837], London; (his sale, Christie's, London, 13 June 1829, no. 36); Rev. Thomas Frognall Dibdin [d. 1847]; sold December 1829 to Joseph Neeld [d. 1856], Grittleton House, near Chippenham, Wiltshire; by inheritance to his brother, Sir John Neeld, 1st bt. [1805-1891], Grittleton House; by inheritance to his son, Sir Algernon William Neeld, 2nd bt. [1846-1900], Grittleton House; by inheritance to his brother, Sir Audley Dallas Neeld, 3rd bt. [1849-1941], Grittleton House; by inheritance to Joseph Neeld's descendant through an illegitimate daughter, Lionel William [Inigo-Jones] Neeld [d. 1956], Grittleton House; (his sale, Christie, Manson & Woods, London, 9 June 1944, no. 18); purchased by Koetser or Rocker. (Wildenstein & Co., Paris, New York, and London); sold December 1944 to the Samuel H. Kress Foundation, New York; gift 1946 to NGA. According to an undated letter from early 1986, an annotated copy of the 1944 Neeld sale catalogue at the Getty Provenance Index states that "Rocker" purchased lot 18 (Julia A. Armstrong to Suzannah Fabing, in NGA curatorial files). However, two other annotated copies of the sale catalogue (photocopies from both in NGA curatorial files, one from the Knoedler Library fiche of British sales) indicate that lot 18 was purchased by "Koetser," almost certainly the dealer David M. Koetser. This theory is supported by a passage in The Paintings of The Betty and David M. Koetser Foundation (introduction by Malcolm M. Waddingham, catalogue by Christian Klemm, Zurich and Doornspijk, 1988: 10), in which Koetser's purchase of "the rare Landscape with Peasants by Louis Le Nain" is described. It is possible that "Rocker" was a pseudonym used by Koetser. It is not clear whether Koetser was buying for himself, or for, or with, Wildenstein. Koetser's letter of 20 January 1969 to Colin Eisler contains a list of some of the non-Italian paintings he sold to the Kress Foundation followed by the sentence "And indirectly, Louis Le Nain's 'Landscape'..." (copy in NGA curatorial files). The "memorandum of agreement" between Wildenstein and the Kress Foundation for the purchase of ten paintings, including Louis Le Nain's Peasants in a Landscape, is dated 28 December 1944 (copy in NGA curatorial files). Colin Eisler, Paintings from the Samuel H. Kress Collection: European Schools Excluding Italian, Oxford, 1977: 266 n. 14, incorrectly gives the date of the Kress acquisition as 1946, misspells Hibbert's name as Hibbard, and indicates the painting sold for fifty guineas in 1789, when the Ellis Waterhouse letter to which he refers only says the painting was priced at fifty guineas. Pictures by The Brothers Le Nain, Burlington Fine Arts Club, London, 1910, no. 10, repro. Exhibition of French Art 1200-1900, Royal Academy of Arts, London, 1932, no. 109. Le Nain, peintures, dessins, Petit Palais, Paris, 1934, no. 27 as Paysage avec Figures. Recent Additions to the Kress Collection, National Gallery of Art, Washington, D.C., 1946, no. 783. Les frères Le Nain, Galeries nationales du Grand Palais, Paris, 1978-1979, no. 36, repro. France in the Golden Age: Seventeenth-Century French Paintings in American Collections, Galeries nationales du Grand Palais, Paris; The Metropolitan Museum of Art, New York; Art Institute of Chicago, 1982, no. 47, repro., as Peasants in a Landscape. Obras Maestras de la National Gallery of Art de Washington, Museo Nacional de Antropología, Mexico City, 1996-1997, unnumbered catalogue, 70-71, color repro. Paintings and Sculpture from the Kress Collection. National Gallery of Art, Washington, 1945 (reprinted 1947, 1949): 153, repro. Frankfurter, Alfred M. Supplement to the Kress Collection in the National Gallery. New York, 1946: 58, repro. Cairns, Huntington, and John Walker, eds., Great Paintings from the National Gallery of Art. New York, 1952: 110, color repro. Cooke, Hereward Lester. French Paintings of the 16th-18th Centuries in the National Gallery of Art. Washington, D.C., 1959 (Booklet Number Four in Ten Schools of Painting in the National Gallery of Art, Washington, D.C.): 18, color repro. Paintings and Sculpture from the Samuel H. Kress Collection. National Gallery of Art, Washington, 1959: 344, repro. Walker, John. National Gallery of Art, Washington, D.C. New York, 1963 (reprinted 1964 in French, German, and Spanish): 206, repro. Summary Catalogue of European Paintings and Sculpture. National Gallery of Art, Washington, 1965: 74. Cairns, Huntington, and John Walker, eds. A Pageant of Painting from the National Gallery of Art. 2 vols. New York, 1966: 2:292, color repro. European Paintings and Sculpture, Illustrations. National Gallery of Art, Washington, 1968: 65, repro. European Paintings: An Illustrated Summary Catalogue. National Gallery of Art, Washington, 1975: 192, repro. Eisler, Colin. Paintings from the Samuel H. Kress Collection: European Schools Excluding Italian. Oxford, 1977: 266-267, fig. 246. Walker, John. National Gallery of Art, Washington. Rev. ed. New York, 1984: 318, no. 421, color repro. European Paintings: An Illustrated Catalogue. National Gallery of Art, Washington, 1985: 225, repro. National Gallery of Art, Washington. National Gallery of Art, Washington, 1992: 162, repro. Rosenberg, Pierre. Tout l'oeuvre peint des Le Nain. Paris, 1993, 80-81, no. 34, pl. XXI, as Paysage avec vieille femme, joueur de flageolet et vielleur. Hand, John Oliver. National Gallery of Art: Master Paintings from the Collection. Washington and New York, 2004: 175, no. 137, color repro. The Arts of France from François Ier to Napoléon Ier. A Centennial Celebration of Wildenstein's Presence in New York. Exh. cat. Wildenstein & Co., Inc., New York, 2005: 52, fig. 13, 71 (not in the exhibition). Conisbee, Philip, et al. French Paintings of the Fifteenth through the Eighteenth Century. The Collections of the National Gallery of Art Systematic Catalogue. Washington, D.C., 2009: no. 70, 318-322, color repro.